There are some amazing Australian raptors. Birds of prey are some of the most amazing birds in Australia. Raptors and owls have confused taxonomists all over the world with their surprisingly different evolutionary backgrounds. Their similar lifestyle – hunting and carnivorous diet – have caused unrelated birds to develop similar adaptations and features such as hooked and bills, strong sharp claws and excellent eyesight. In Australia, raptors are adapted to all habitats. In arid areas they are often found near water because water attracts prey. Fish-eating raptors such as ospreys and sea eagles are found along the coastline, and Pacific Baza, a hawk that eats frogs live in tropical rainforests. Black Kites can gather in large numbers at rubbish tips. Bushfires attract many raptors that catch fleeing animals, and in wheat-farming country small raptors gather around grain silos that attract mice. Hawks, kites and falcons cover the whole continent of Australia including Tasmania, and ospreys are found on all Australian coasts. 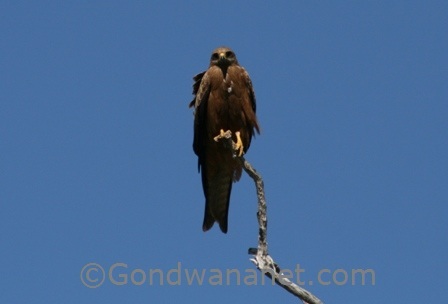 Black Kite (Milvus migrans), a relatively small bird of prey, lives on open plains and timbered watercourses, rubbish dumps and cattle yards. Flocks of them can be seen soaring around and attending bushfires. Brown Falcon (Falco berigora) lives in most land habitats except closed forests, and can be seen flying slowly, gliding on raised wings and hovering, or perching on fences, posts and wires. Osprey (Pandion haliaetus) lives in inshore seas, coastal islands, or mangroves, rivers and estuaries where it builds large nests on prominent headlands, trees and communication towers. It patrols over water, hovering and soaring on long, angled wings, and plunging feet-first. The largest Australian raptors are eagles: the White Bellied Sea-eagle which is found on all Australian coasts and a bit inland, and the Wedge Tailed Eagle, Australia’s largest bird of prey, which is found everywhere except on the waterless plains of inland Western Australia. The White Bellied Sea Eagle (Haliaeetus leucogaster) is the largest of the three marine raptors that live on Australian coasts. 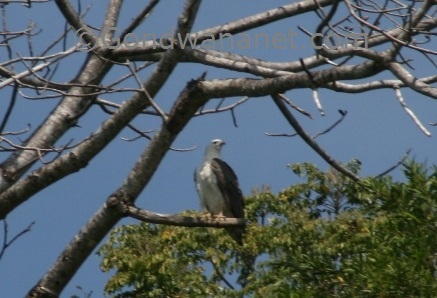 (The others, the Osprey and the Brahminy Kite, are not quite as widespread in Australia). The White Bellied Sea Eagle has got a wingspan of over two metres. Its head and belly are white while the back and wings are grey. It is found around large rivers, fresh and saline lakes, coastal seas, islands and reservoirs, where it eats fish, eels, reptiles such as turtles and sea snakes, birds and their chicks, and mammals such as bats and others. It can eat small prey in flight, and will harass other birds such as gulls, gannets and other raptors to rob their catch. It is known to follow dolphin pods and farm machinery, and occasionally attack seals to pinch their prey. The White Bellied Sea Eagle is usually seen alone or in pairs. Female lays 1-2 eggs in a stick nest in a tree or on a cliff near water. As in all raptors, it starts incubating as soon as the first egg is laid, which means that the oldest chick hatches earlier than the youngest and will grow larger. It will not let the younger sibling eat and often attacks or kills it. Some good places to see the White Bellied Sea Eagle are Fraser Island in Queensland, Kakadu National Park in Northern Territory, and Bundjalung National Park in New South Wales. The Wedge Tailed Eagle (Aquila audax) is Australia’s largest bird of prey with a wingspan of 2.5m. It is black or dark brown, with black flying-feathers and a long black diamond-shaped tail. The Wedge Tailed Eagle is widespread from open plains and desert to forested mountains, but is most common in open habitat. It eats rabbits and hares, large lizards, birds, kangaroos and wallabies, sheep and also roadkill. But its main food is rabbits and hares – good news for Australia where the introduced rabbits are one of the worst pests. Rabbits have probably helped to increase the populations of Wedge Tailed Eagle and it is good that such large bird of prey remains abundant. Wedge Tailed Eagles are often seen soaring high up in the sky either alone or in pairs. They live in life-long pair bonds and defend a large home range. They hunt mostly at dusk or dawn and take it easy during the midday when it is too hot. They usually breed between June and August. Female lays 1-3 eggs in a stick nest, but often only one of the youngs survives. Their nests are huge, up to 2m wide and 3m deep, and where trees are available the nests are high up in the trees, allowing wide views over their home range. Some good places to see the Wedge Tailed Eagles are Sturt National Park in New South Wales, and Nullarbor Plain and Flinders Ranges in South Australia. 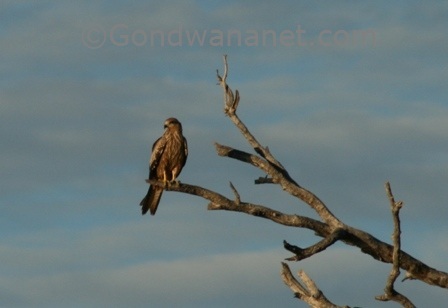 Good places to watch other Australian Raptors are Kakadu National Park in Northern Territory (the rare Red Goshawk and many other species), Bundjalung National Park in New South Wales (coastal species), and habitats around Townsville in north Queensland. Australian zoo parks and animal sanctuaries also often have birds of prey on display.